Those lucky enough to be in the audience for the gig will be treated to a 20-piece string section and an immersive set incorporating luminous curtains, lights, projections and said nudey film. “Sometimes it’s as good to get your kit off as it is to wear a magnificent frock!” she adds, followed by the best laugh I’ve heard in ages, starting with a hearty cackle and rising to a girly giggle. It’s a laugh she breaks out often during our conversation, yet another reflection of the happy place she’s in right now. So let’s rewind. Eska Mtungwazi was born in Zimbabwe and moved with her family to south London aged two. “I still have memories of being a baby in Zimbabwe. A smell can trigger a huge rush of feeling like no other and I have recurring dreams of specific places like my grandmother’s house,” she says. 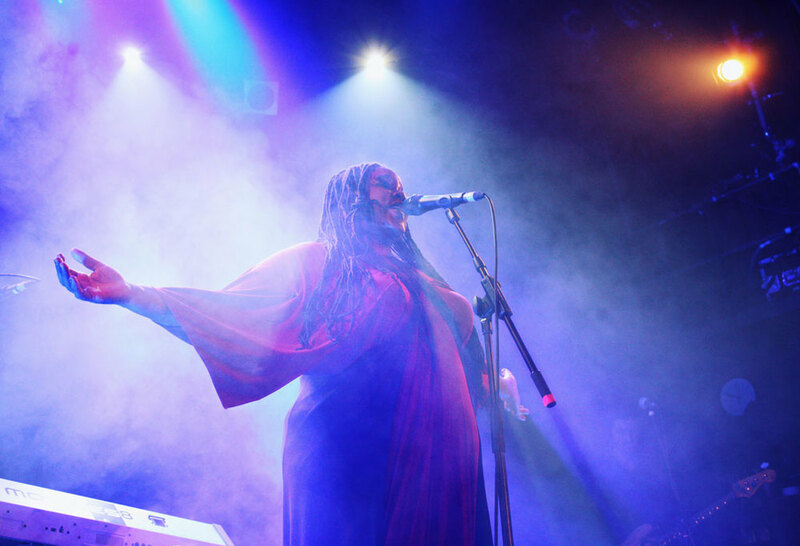 Eska grew up listening to her mother singing worship songs in their native Shona and her father’s varied record collection, ranging from The Crusaders to Madonna. She learned violin at school, which earned her a scholarship. She joined a madrigal group and the church choir, and developed a love of Kate Bush and Joni Mitchell. It was clear music was her calling but her parents had other ideas so she studied mathematics and became a schoolteacher. Giving lessons in trigonometry by day, she became a sought after session musician, writer and backing singer by night. She worked with a diverse range of artists including Ty, Tony Allen, Bobby McFerrin, Zero 7, Nitin Sawhney and Courtney Pine. In the process though she lost herself as a musician, and let her self-doubts hold her back. Eventually something clicked and she decided to step into the light. She immersed herself in everything from folk to prog rock, reggae to pop, classical to the blues. She worked with producers Matthew Herbert, Louis Hackett and David Okumu, and after countless late night sessions, finished the album in 2010. Struggling to get signed, she released her first single The Gatekeeper on her own Earthling Records in 2013. In 2014 Eska welcomed a surprise pregnancy (she’d always believed she was unable to have children) but her daughter Wonder was born prematurely and fought for her life in hospital for several months. Thankfully mother and daughter survived those dark days and in April 2015 Eska’s eponymous debut album also finally came into the world. Her expansive range of talents and interests flood into every inch – from the instruments she plays (violin, cello, clarinet, harmonium, cuatro, skank organ, glockenspiel, tubular bells, vibraphone and even a Speak & Spell machine) to the lyrics she writes (ranging from deeply personal to the mythical) and delivers in her sometimes soaring, sometimes croaky, sometimes delicate and always captivating voice. Expect its independent release in 2017. Meanwhile she’s contributed a song to UNKLE’s upcoming album, still teaches occasionally by giving her time to programmes nurturing music in young people, and has her hands full with Wonder too. “Having a two year old is as hard as controlling a class of 32 seven year olds,” she says, laughing that infectious laugh again. “She smiles if I play ‘Mummy’s music’ in the car and we’ve put one of her synthesiser improvisations onto SoundCloud.” Look out for the one they call the Eyeball Kid.